Geometiles is a fun, yet sophisticated tool that aims to spark a lifelong love of math in kids in grades one through 12. Created by a PhD math coach, this set of interlocking tiles comes with a free online resource library. Perfect educational toy, and allows a child's imagination to play. 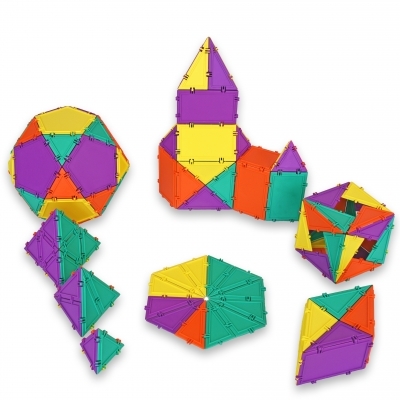 Great for STEM learning, and fine motor skills. I would use this in my classroom for my 1st graders to make math learning more fun! Really great packaging, the box was very eye-catching. The interlocking tiles makes learning math fun for kids of all ages. Fun tool to ignite a child love for math. The online resource library is a great addition.